If you're shopping for fun and affordable 70th birthday gift ideas for Grandma, you're in the right spot! Our hand-picked 70th birthday gifts start at under $25, and you're sure to find a present that will delight your grandmother! Every Birthday Front Page from All 70 Years! 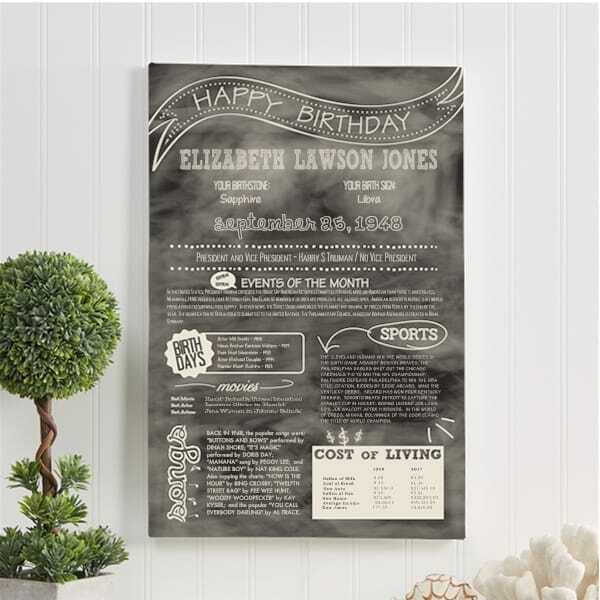 One of our top-selling 70th birthday gifts, this unique stroll down memory lane is sure to impress! The personalized book features every single birthday page from the New York Times for all 70 years. It also includes an exclusive photo-packed 20 page timeline and additional world headline pages. A unique gift that is sure to spark memories - and that Grandma will enjoy reading the 140 page book long after her birthday is over! 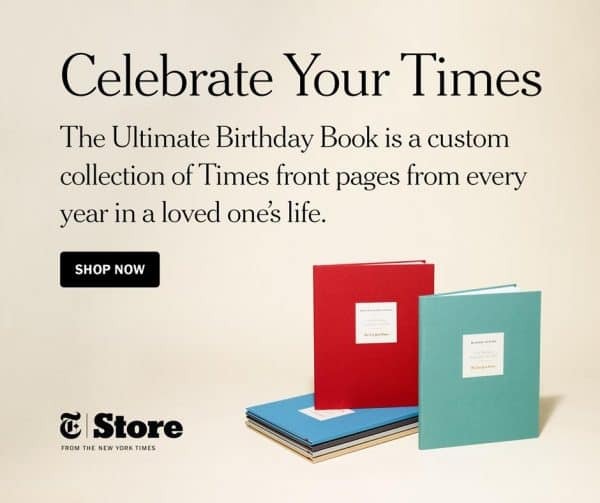 Enjoy Free Shipping on up to 2 Custom Birthday Books or Ultimate Birthday Books at The New York Times Store. Expires 12/31/2019. This unique canvas is sure to spark conversation, as it's a carefully-researched chronicle of what life was like 70 years ago when your grandmother was born! The custom-made keepsake is personalized with name and birth date at the top. It includes the headline news as well as the top movies and sports results.. It also features a cost-of-living comparison of common items so you can see how much prices have changed. Need a last minute gift? This can ship in just 1-2 days...your grandmother will never know you procrastinated! 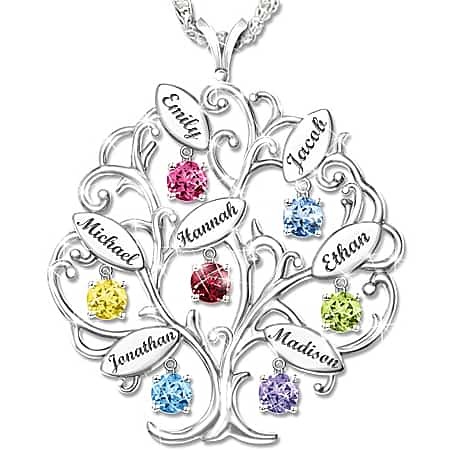 Grandma can celebrate the family's unity with this exquisite solid sterling silver family tree pendant. Shiny leaves sway from the tree's branches and are engraved with the name of up to 7 grandchildren or loved ones. Complementing each leaf is a round birthstone crystal in brilliant color that hangs freely beneath the leaf like a tiny flower. The delicate branches of the tree gracefully weave around the leaves and sparkling stones to produce a truly stunning effect. A fun gift to celebrate Grandma's milestone birthday - at under $50! 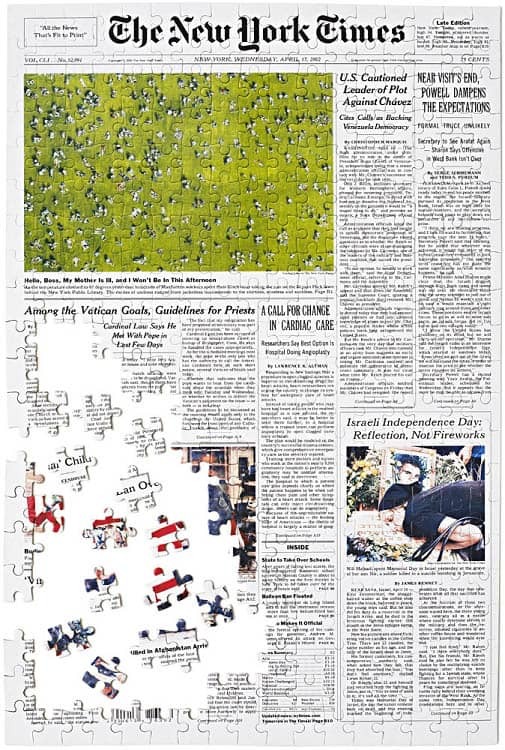 The entertaining puzzle features the front page of the New York Times from the day your grandmother was born. It's available in 3 levels of difficulty (500 pieces, 1000 pieces, or 300 pieces). Grandma will have a fabulous time piecing together the headlines from her birth date. A full-size reproduction of the paper is included for reference while assembling. Take 15% off sitewide at The New York Times Store. Expires 12/31. 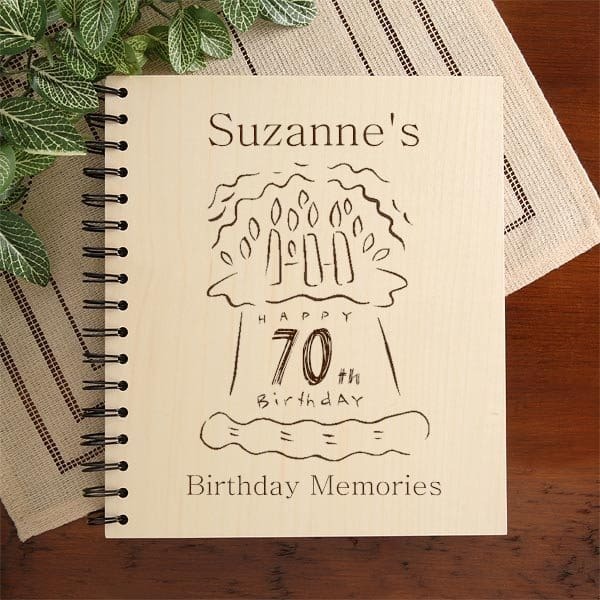 Your grandmother will need a place to store all her pictures from her 70th birthday celebration, and this striking wooden photo album is the perfect choice! Choose from 2 designs, and the guest of honor's name and birthday will be laser-engraved on the front. The maple album features 18 pages - enough room for up to 72 photos. The ideal 70th birthday gift for the grandmother who has a sense of humor - and a taste for wine! Hand painted wine glass is embellished with glitter and rhinestones, and features the phrases "70 is the new" and "What was I saying?". Pair this with a bottle of vino, and Grandma won't be feeling any pain over turning 70! This delightful frame is the perfect way to showcase a favorite photo from Grandmother's 70th birthday celebration! 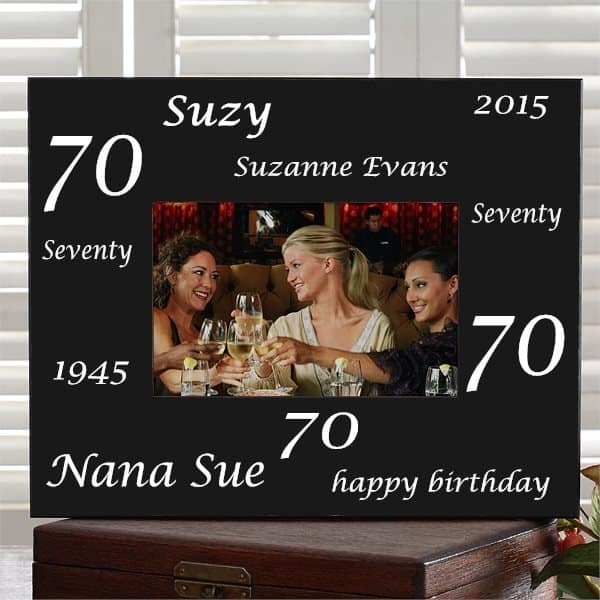 Available in your choice of 6 color schemes, the affordable (under $30) frame features her birth year, the current year, and her age. It also offers 3 lines of personalization for her name or other customization. A stylish gift that will look great on the wall or tabletop! If you're looking for a memorable gift that's bound to impress, this handsome newspaper reprint is the perfect choice! 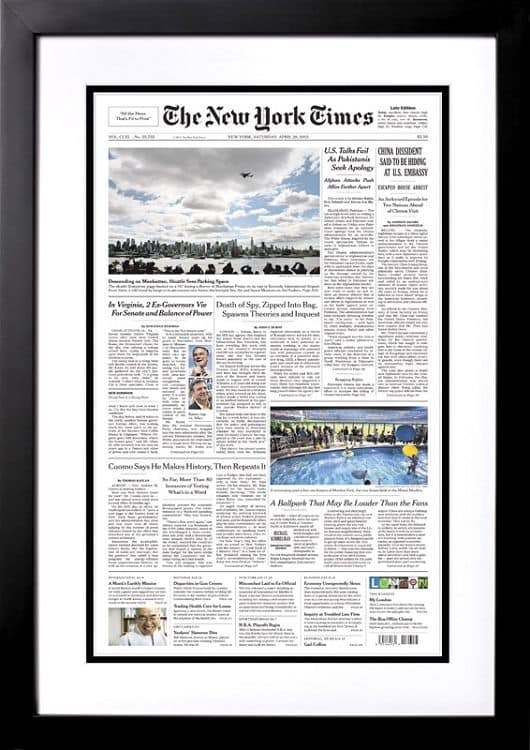 Mark Grandma's special day by ordering her a reprint of the New York Times front page from the day she was born. Reprints are available in 3 sizes - choose framed or unframed. Turning 70 is certainly reason for a celebration, and what's a celebration without champagne? 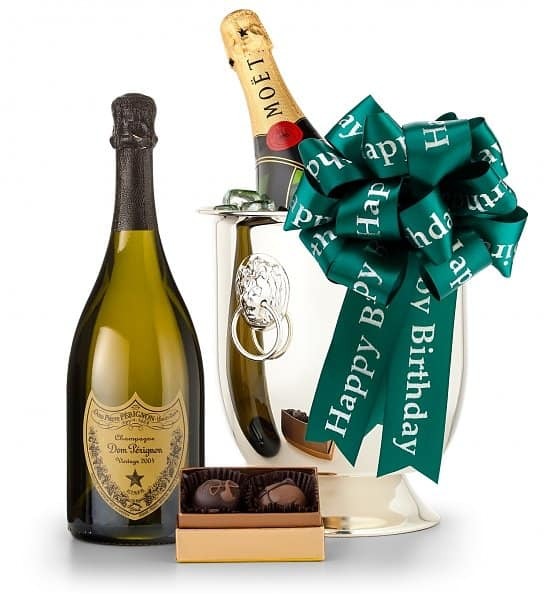 Grandma's bound to be impressed by this elegant champagne and chocolate gift basket! Choose from 4 divine champagnes (prices start at around $70), which will be combined with chocolate truffles. The gift basket is presented in an elegant champagne chiller, which will be a useful keepsake long after the champagne is gone! It includes a hand-tied birthday ribbon, but you can add your own personalized Happy 70th Birthday ribbon for an extra fee. Most women love to be given jewelry for any occasion, and a special occasion like this calls for a spectacular necklace! 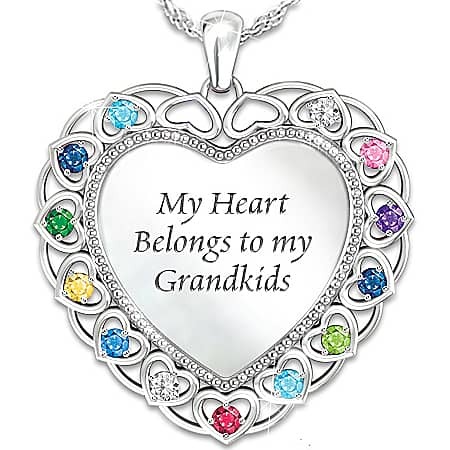 This striking "My Heart Belongs to my Grandkids" necklace fits the bill perfectly. Add up to 15 grandchildren's birthstones on the front, each nestled in an individual heart scroll. Their names are engraved on the back in an elegant script. A sentimental necklace that Grandma will treasure - and love wearing for years to come!